Homesteaders are often whittling, chopping wood, cooking from scratch, processing meat, and preparing food to preserve it. These jobs require knives and other tools with blades and can be rather time consuming. To make the work easier, quicker, and less dangerous, make sure you’re working with sharp blades. This short video shows how to sharpen an axe blade. I like the sharpening stone he’s using…it looks like a good tool to have on hand. Since I’m the one in our family who does all the blade sharpening, I think about it on a pretty regular basis. I sharpen several small kitchen knives before I butcher poultry so that I can process the birds safely, without having to apply much pressure to cut through skin, muscle, and cartilage. It makes the job go much more smoothly and I’m less likely to cut my fingers. I’m not neccessarily a fan of Gordon Ramsey, but this is a good, short video showing you how to sharpen a kitchen knife with a sharpening rod. I use a whetstone for sharpening and it works well also. You can use your stone wet or dry or use oil on it. Once you use oil, you always need to use oil. You can’t switch to water. 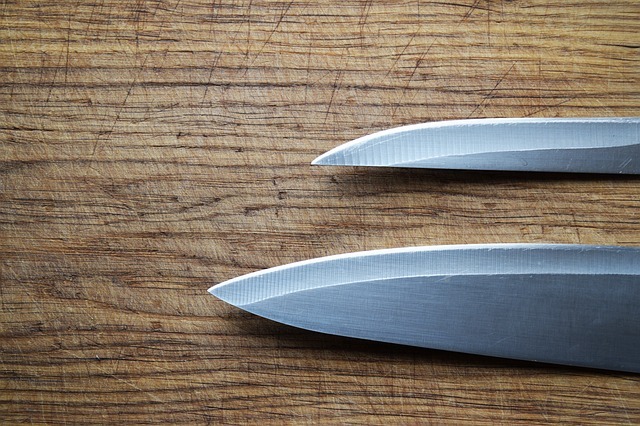 Hold your knife at about a 10 degree angle and draw it backwards so that the stone is moving from the dull part of the knife, across and away from the sharp part of the blade. There are a bunch of videos showing how to do this, but a lot of them are kind of long, so I didn’t share them here. Some people use a circular motion, there are different schools of thought on that. This past week I sat at the kitchen island and sharpened all of our kitchen knives, with the exception of the serrated blades. I don’t use them often, but I found this video that gives instructions for sharpening them…so I want to give it a try. I’ll need to get a ceramic rod to try it. For best results, sharpen your blades each time you use them. Do you sharpen your knives before you use them? What is your favorite method for sharpening blades? A tip my late father gave me years ago is when you cut your meat or anything up and you want to scrape it into a bowl turn your knife over and use the back of it. It keeps the blade from blunting or being damaged. Great tip, Robyne! Thanks so much for sharing 🙂 Sounds like your Dad was a practical guy! I love tools, especially knives. And they must be sharp, of course. Thanks for the links.